On Friday 15 September 2017, the Pharos Arts Foundation presents a recital for solo violin with the sensational Emmanuel Tjeknavorian. 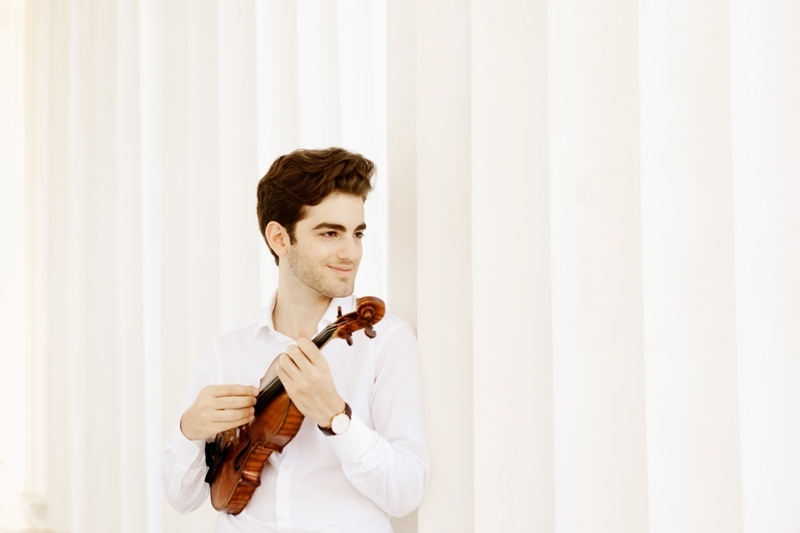 Winner in such important competitions as the Jean Sibelius Violin Competition in 2015 and the Fritz Kreisler Violin Competition in 2014, Emmanuel Tjeknavorian has already achieved international acclaim, and has appeared, in recital and as a soloist with renowned orchestras, in some of the world’s most important concert venues. Tjeknavorian’s return visit to The Shoe Factory in Nicosia will mark the beginning of an extensive tour in some of Europe’s most prestigious venues, including the Musikverein in Vienna, Concertgebouw in Amsterdam, Philharmonie in Luxembourg and Barbican in the UK, where he will perform the same programme – works for solo violin by J.S. Bach, Ysaÿe, Prokofiev, Enescu, Ernst and Ehrenfellner. Emmanuel Tjeknavorian has achieved international acclaim since 2015, when he participated in the Jean Sibelius Competition and won the Second Prize as well as the Award for Best Interpretation of the Sibelius Violin Concerto with the Helsinki Philharmonic Orchestra. Emmanuel was born in Vienna in 1995 and grew up in a family of musicians. He received his first violin lessons at the age of five and had his first public appearance two years later. Since 2011, he has been studying with Gerhard Schulz, formerly a member of the renowned Alban Berg Quartet, at the University for Music and Performing Arts Vienna. Apart from the Sibelius Competition, Emmanuel has won numerous prizes at international music competitions such as the Fritz Kreisler Competition (the first Austrian in the history of the competition to have won a prize), the Johannes Brahms Competition and the Eurovision Young Musicians Competition, which was broadcast throughout Europe as part of the opening ceremony of the Vienna Festival. Despite his young age, Emmanuel Tjeknavorian has already appeared in the Vienna Musikverein, the Vienna Konzerthaus, the Munich Prinzregententheater, the Boston Symphony Hall and the Helsinki Music Centre, amongst others. As a soloist, he has performed with the Vienna Radio Symphony Orchestra, the Orchestra della Toscana, the Finnish Radio Symphony Orchestra, the Boston Pops Orchestra, the Helsinki Philharmonic Orchestra and the Munich Chamber Orchestra, under the baton of such conductors as Cornelius Meister, Keith Lockhart, Hannu Lintu and John Storgårds. Highlights of the current season include engagements with the Vienna Symphony, the Frankfurt Radio Symphony at the Easter Festival Warsaw, the Bruckner Orchestra Linz, the Camerata Salzburg and the Bogotá Youth Philharmonic Orchestra under the baton of Andrés Orozco-Estrada. Emmanuel has been selected to participate in the Rising Stars series of the European Concert Hall Organisation during the 2017/2018 season. Forthcoming engagements include recitals at the Rheingau Music Festival, the Andermatt Classics, the Menuhin Festival Gstaad and the Festival Mecklenburg-Vorpommern’s cycle “young elite”. In 2018, Emmanuel Tjeknavorian will be part of the Orpheum Foundation and will make his debut with the Tonhalle Orchestra Zurich under Michael Sanderling.